Be not fooled by these comfortable smiles. Peer closer, through the instagram’d veneer, to another layer – the film of grime and grit that no ersatz 70’s fake antique Polaroid can mimic. No, the mask worn by these riders tells a tale of hardship and suffering that one could overlook, given the chintzy National Trust setting and the fine tea service on display. It is the ROAD, reader, the road that has written its cruel lines on the faces of these brave hearts. 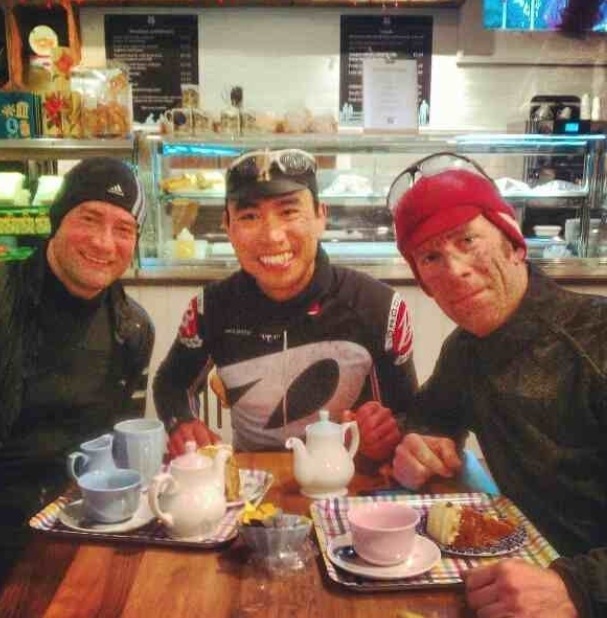 The range of cakes available in the centrally heated cafe atop Box Hill might have been superb, and the tea plentiful, but don’t be fooled by the chance timing of this picture’s arbitrary moment. Look beyond those eyes at the freezing rain that had lanced down upon bike and rider since departing that cold, bleak day. See etched there the misery of punctures, non-adhesive patches, bulging inner tubes, and the cruel futility of the mini pump. Alas, that this should be maiden voyage of one Craig Mackenzie, fresh from the rigors of Regents, unschooled in the art of sitting on Lowell’s wheel, naive to the rhetoric of pain. Pity his innocent expression that seems to say “We’ll, this isn’t so bad, what’s the fuss about?” No, poor novice, life in the Baroudeur chain gang is not all tea for one and china plates; it is dirt, it is pain.